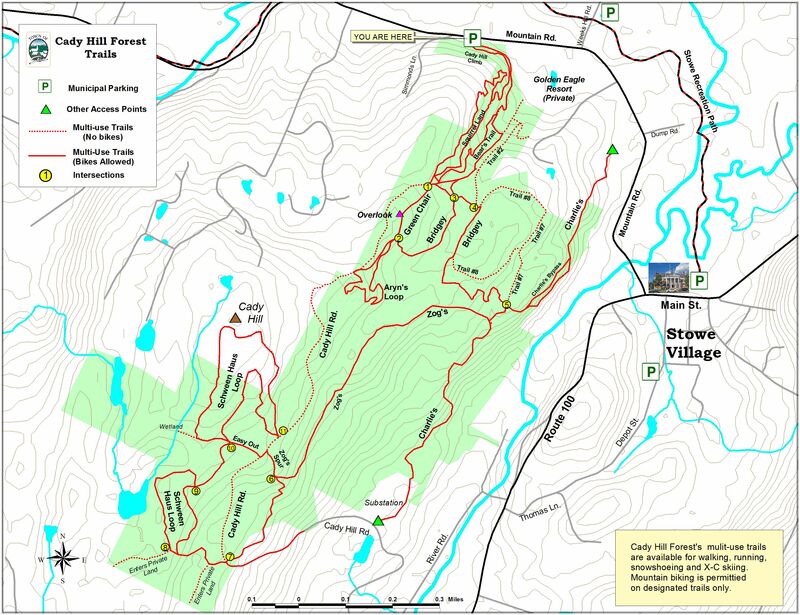 The good citizens of Stowe stepped up once again at town meeting this past March and for the second year in a row approved a capital budget line item of $20,000 for the continued improvement of trails at the recently acquired Cady Hill Forest. In 2012 Stowe taxpayers approved $288,000 to go toward the purchase and improvement of the Cady Hill Forest. Those monies coupled with grants of $350,000 and $100,000 from the Vermont Housing and Conservation Board and the Open Space Institute respectively and an additional $800,000 raised by the Stowe Land trust through private donations allowed for the purchase of the Cady Hill Forest. The Cady Hill Forest, which consists of 320 acres and 11 miles of trails of town owned land, is located right in the center of town and provides mountain biking, hiking, x-country skiing and snow shoeing opportunities for locals and visitors alike. This year's budget of $50,000 for new trail construction and trail maintenance consists of $20,000 from the town, $20,000 from a Recreational Trails Grant and $10,000 donated by the Stowe Mountain Bike Club (SMBC). All new trail construction and maintenance at Cady Hill Forest is the responsibility of SMBC through an agreement with the town. SMBC accomplishes this important work with the help of paid private contractors and volunteers.